Nora’s classes at Ibiza Calm are designed to accommodate the needs of each student, using all the tools of yoga to help them build a stronger relationship with themselves, one that is founded in self-care and self respect. Together teacher and student explore how to integrate this practice in their lives, with humour and authenticity. 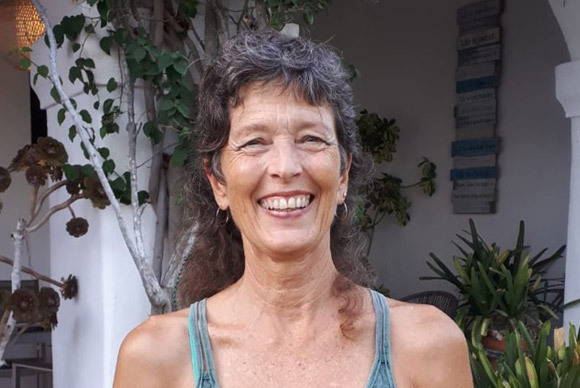 Nora has been a permanent year-round resident in Ibiza since 1984. She began teaching Yoga that same year and has been training yoga teachers since 2001. She is a certified Yoga Therapist and Massage Therapist and she holds a U.S. Bachelor’s Degree in Psychology and Foreign Languages. Her journey of recovery began in 1993.